You should sell the recipe to your work place. Haha, I think they'll be ok without it. I had seen this kit a few weeks ago and wanted it because I really like the beer that it's modeled after, but I didn't pull the trigger. Then last week I got a coupon code from Northern Brewer for an extra 20% off your order plus free shipping and I couldn't resist. It's been a little while since I've brewed with a pre-set kit. Now I just need to figure out when I'm going to have time to make it. I like to have a new darker beer ready for the holidays but I'm not sure that's going to happen in this case. It would probably be ready in time if I made it this week/weekend, but I don't really want to leave it unsupervised for 2 weeks while we are in Europe, which pushes brew day to the end of October and then it wouldn't be close to ready by Christmas. It's supposed to be like Dragon's Milk which is a very good beer from New Holland Brewing. wags83 wrote: Source of the post It's supposed to be like Dragon's Milk which is a very good beer from New Holland Brewing. Finally got around to brewing this yesterday. The house smelled like coffee while I was steeping the specialty grains. My starting gravity was a bit higher than what the recipe says it should be, but it's close. Erin probably loved the smell. Coffee snob! She wasn't home during that part so she missed out! Haven't made a new beer since last year so decided to have a brew day today. Trying a Kolsch style ale. It'll be the lightest beer style I've ever tried, so hopefully I don't get any off flavors. I think I did a kit of that as one of my first beers. Going for a Busch light flavor profile? Maybe not quite that light, but close. When will it be ready to drink? Tyler wrote: Source of the post When will it be ready to drink? I'll for sure leave it in the fermenter for a couple more weeks at least. Then I guess bottle it and see how long carbonation takes. Probably a 5-6 weeks away from being ready. Bottling tonight. 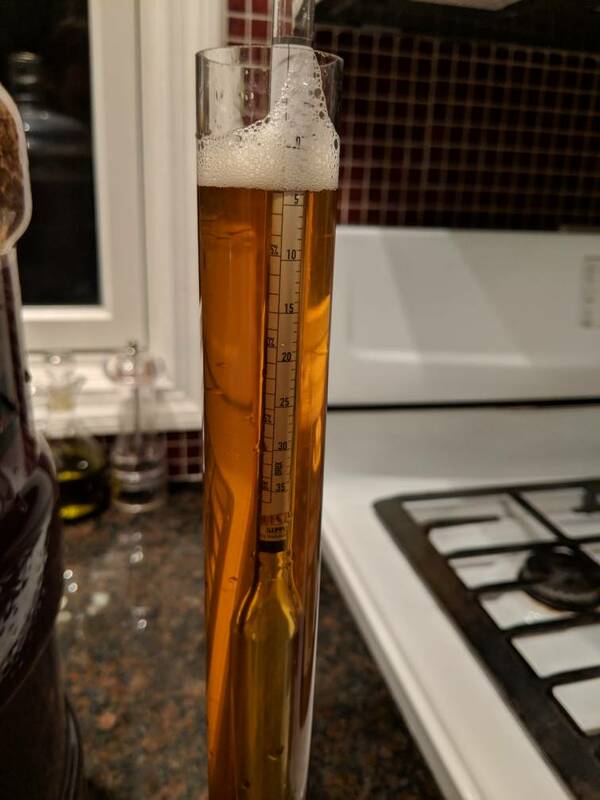 Final gravity is at about 1.010. I used gelatin for the first time for fining. Really happy with how clear it turned out. Hopefully it carbonates well. Looks really clear. Does the jelly just make it settle on the bottom more? Yeah it pulls the protiens and whatnot into clumps so it settles at the bottom better. I've never tried it before but I'm really happy with the results so far. Hopefully is carbonates well. Tyler wrote: Looks really clear. Does the jelly just make it settle on the bottom more? I like the reflection shot.